As a parent one of the most important things to do is to provide the best possible products in the market for your baby. Especially when it comes to a bath. With hundreds of products available in the market, how do you know the best baby soaps for your baby? Your baby’s skin type may vary from dry, to normal to extra dry or oily. Besides, you have to ensure that post-bath, the baby’s skin is smooth and supple and does not cause any irritation. We have curated a detailed list of best baby soaps in the market to ensure you are on a journey to a wonderful bath time with your precious little child. Make bath time a worry-free activity for you and your little one with this product. This shampoo has complex plant-based proteins which gently cleanses the skin and hair of your baby. This baby bath soap is mild and will moisturize the skin from head to toe as it is prepared with a special formula. It will leave your little one feeling pampered and loved after a shower. It is clinically tested for safety and is chemical-free. It has no tears formula. It has a mild lather. It has an anti-irritation formula. Your little one will splash and enjoy a lovely bath with the Mustela Gentle cleansing gel. It is perfect to use both on body and hair right after the first few weeks after your baby’s birth. The baby soap will help you wash your baby’s body and scalp by making a gentle lather. It must be rinsed carefully after with Luke warm water. It ensures that the natural oils present in your baby’s skin remain as they are. It is a plant-based formula. It is fortified with Vitamin B5. It is Paraben, Phenoxyethanol free. It is only available in 500ml bottles. This product is made from a plant-based protein with avocado which will leave your baby’s skin smooth and clean. The Avocado Perseose will hydrate any dry skin your baby has and will ensure there is no allergic reactions post-bath. Your baby will be a happy bundle of joy after a bath with this shampoo. It is one of the best bath soaps for babies with dry skin. Sometimes, if your baby has dehydrated skin, you may need a baby soap for eczema, and this is soap is perfect for that. It gently cleans your baby’s skin and removes any impurities without being harsh on the skin. It also moisturizes the skin well. It has aloe-vera, cucumber, ginger, parsley, spinach, and kiwi which all have highly nourishing properties. It is Paraben, dye, and gluten-free. It has nourishing ingredients such as aloe vera and cucumber. It has a slightly strong fragrance. 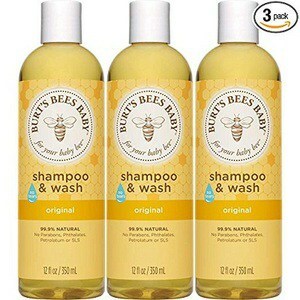 You will love this shampoo as it revitalizes your baby’s skin with gentle, all-natural ingredients organically sourced. The product is crafted carefully to ensure that it is eczema friendly and is all-around nourishment for skin, hair, and scalp of your baby. Make bath time a worry free activity for you and your little one with this product. This shampoo has complex plant-based proteins which gently cleanses the skin and hair of your baby. This baby bath soap is mild and will moisturize the skin from head to toe as it is prepared with a special formula. Your little angel will not cry during this bath as the formula of the soap is all natural and ensures your baby is tear-free during that time. It is free of chemicals and is safe for your baby’s skin. It has a neutral PH level. It is not suitable for babies with eczema. 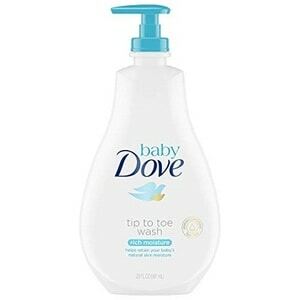 The dove baby shampoo is a great product for daily usage. It is milky and has a creamy texture which will leave your baby’s skin soft and supple post-bath. The nutrients rich formula will leave your baby happy and relaxed after a bath. Make bath time a fun activity that your baby looks forward to every day with this classic product from Dove. The formula for this shampoo is created without parabens or sulfates and has a neutral PH balance. The baby washes lathers well and after bath leaves your baby’s skin soft and silky smooth. It is also gentle on the mom’s skin, so it benefits you as well! It has a rich, creamy texture. It doesn’t have a fragrance. 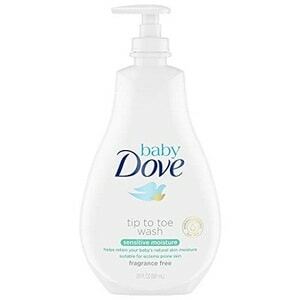 This dove baby soap is something that you can use daily. It produces good lather with less water. Dove is gentle on your little one’s skin and will leave no residue, making it easy to dry your baby’s body and hair. We hope our carefully curated list of best baby soaps in the market brings you solace and helps you pick the best one for your little one.